Lindon, UT – October 29, 2009 – Today Footnote.com (http://www.footnote.com) announced it will digitize and create a searchable database for all publicly available U.S. Federal Censuses ranging from the first U.S. Census taken in 1790 to the most current public census from 1930. Through its partnership with The National Archives, Footnote.com will add more than 9.5 million images featuring over a half a billion names to its extensive online record collection. With over 60 million historical records already online, Footnote.com will use the U.S. Census records to tie content together, creating a pathway to discover additional records that previously have been difficult to find. To date, Footnote.com has already completed census collections from two key decades: 1930 and 1860. As more census decades are added to the site, visitors to Footnote.com can view the status for each decade and sign up for an email notification when more records are added to the site for a particular year. View the Census Progress Page on Footnote.com. See the 1930 Interactive Census record for Jimmy Stewart. Footnote.com works with the National Archives and other organizations to add at least a million new documents and photos a month to the site. Since launching the site in January 2007, Footnote.com has digitized and added over 60 million original source records to the site, including records pertaining to the Holocaust, American Wars, Historical Newspapers and more. “We will continue to move aggressively to add records to the site, specifically those that are requested by our members and others that are not otherwise available on the Internet,” said Wilding. Visit http://www.footnote.com/census/ to see how the census on Footnote.com can truly be an interactive experience. Footnote.com is a subscription website that features searchable original documents, providing users with an unaltered view of the events, places and people that shaped the American nation and the world. At Footnote.com, all are invited to come share, discuss, and collaborate on their discoveries with friends, family, and colleagues. For more information, visit http://www.footnote.com. 2010 will be the 75th anniversary of EWGS, but as early as 1932 Florence Brown and Mary Elizabeth Dow Maltbie had met at the Carnegie Library (1st and Cedar) and discussed forming a genealogical society. On October 12, 1933, Mrs. Maltbie, her daughter Mrs. Rawlings, Mrs. Mercer, Mrs. Pinkham and Mrs. Wetherill met on the mezzanine of the Davenport Hotel to plan a Historical/Genealogical Society. 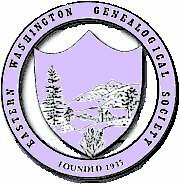 The DAR had been working on the Washigton Pioneer project and this led to the idea of forming a genealogical society. --from the Volume 22 of the Bulletin on the 50th anniversary of EWGS in 1985. Samuel Pool Weaver was the first President of EWGS, and as noted above never served a day as president. He was born in Greensburg Pennsylvania October 20, 1882 son of Jacob Peter Weaver (1843-1927) Greensburg Pennsyvania and Mary Jane Pool (1848-1917). He had at least two wives: first one was Elsa Eberbach of Ann Arbor Michigan born July 24, 1885. They had one son William Pool Weaver. In 1957 he married Mary Helen McCrea, daughter of Mr and Mrs. William McCrea. She was a librarian. Samuel was a lawyer and moved from Cheney to Spokane in 1922 and practiced law till 1939. From 1928 he was also president of Great Northwest Life Insurance Company till he retired in 1955, a professor of constitutional law at Gonzaga Law School from 1929 to 1948. He was also a WWI veteran, having been inducted at Cheney, Washington October 19, 1918, and served with the Students Army Tng (training?) Corps at the State Normal School at Cheney, Washington to discharge. He was a private. He was honorably discharged December 17, 1918. In the Spokane Public Library there are two books by Samuel; Autobiography of a Pennsylvania Dutchman  in the Northwest Room. Very interesting book, but no mention of being an EWGS president. The second book is Weaver, Kiehl, Pool, Bierer-Muller families; genealogical data and charts. . This book is in the Genealogy section on the third floor. I wondered if he was related to my Pools, but his was from England and mine were from Holland. Samuel Pool Weaver died in Miami January 23, 1963 and is buried in Fairmount Cemetery. You can see previous days by clicking the previous link near the bottom of the cartoon. Do You Have a Ten-Spot for Technology? Do you think $10 could buy you a new, state of the art computer? Well, maybe not one for your home but it could potentially buy a lot of new computers, printers and software for the libraries. We’re looking for $10 from 2700 people in order to raise the $27,000 required in matching funds needed to take advantage of year two of the Gates Opportunity Online Technology Grant. The match this year is greater than it was last year. In year one we had to obtain just 30% in matching funds and that was achieved thanks to The Johnston-Fix Foundation, The Friends of Spokane Public Library, The Inland Northwest Community Foundation, Cathy and Charles Simon and The Spokane Public Library Foundation. Their generosity enabled us to access nearly $43,000 from the Gates Foundation resulting in an infusion of $57,200 into the library. This money was used to purchase new computers for all six branches replacing many of the outdated computers we were using. We are now working on year two of the grant and have to raise a 50% match in order to qualify for $27,300 from the Gates Foundation. This is where we need your help. The Spokane Public Library Foundation is handling the fundraising for these matching funds and they have donation boxes in all of the library branches as well as at all Global Credit Union locations (thank you Global Credit Union!). We only have until March 1, 2010 to raise this match or we lose the Gates Foundation monies. Look for the "ten-spot for technology" donation boxes and please consider dropping in a 10-spot (or more) so that we can reach our goal and continue to upgrade the computers in our libraries. Imagine our success if everyone who came to our libraries kicked in $10 (over 85,000 visits to the libraries just in the month of July)! Why is this so important? Computer usage at the libraries is growing like crazy. Approximately 600 people use the Internet computers every day and countless others use our word processing computers and wireless access. More and more customers depend on the library’s computers as their own computers age out or they cancel their Internet at home. The monies will also allow us to expand our computer education classes and create a mobile computer education lab that can be used at all of the branches. Libraries are an integral part of the information age and good computer access is key! Think about what just $10 can do"
For more information please call The Spokane Public Library Foundation at 444-5318. Donations in check form should be made out to The Spokane Public Library Foundation. They can be dropped off at any branch or mailed directly to the Foundation at 906 W. Main Ave, Spokane, WA 99201. EWGS uses these computers for the Internet Genealogy classes, so hopefully our members will help.